Staatsburg, N.Y. - The halls are being decked! 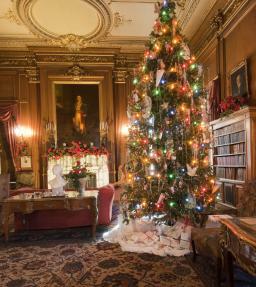 Staatsburgh State Historic Site is preparing for its festive Gilded Age Christmas, featuring sumptuous decorations throughout the mansion and special children&apos;s programs from late November through New Year&apos;s Eve. The site opens for the holiday season on Friday, November 28, and offers public hours Thursday through Sunday, from Noon to 4pm (closed Christmas Day) through December 31. Special evening hours are from 6pm to 8pm on Friday December 12, and additional days for visiting the mansion include Noon to 4pm on Monday, December 29 through Wednesday, December 31.
schemes every season, for the formal dining room and other spaces." visitors can experience the decorated mansion after dark, and tour the historic rooms, populated with guides in period costume. Sundays in December, from 1pm until 4pm, children ages 6 to 11 and their family members are invited to solve a "history mystery" in the Holiday Whodunit. The young detectives will interview costumed interpreters, who portray Gilded Age houseguests and servants. The Holiday Whodunit has become an annual tradition for many families, who come each December to enjoy the holiday decorations and crack another Gilded Age case. Children who submit a guess as to "whodunit" will be entered in a drawing for a prize. vacation: Saturday, December 27 and Tuesday, December 30th, 2-3:30pm. Children ages 6 - 12 can make their own mouse houses out of boxes and various craft materials. A parent or guardian must accompany child; $5 materials fee per child. Reservations recommended: (845) 889-8851. Staatsburgh&apos;s museum shop is a favorite stop for many Hudson Valley shoppers. It features a unique selection of jewelry, books, scarves, keepsakes and gifts. The shop will be open during all touring hours. Post Road in Staatsburg, off Route 9 between Rhinebeck and Hyde Park. The historic site is one of six sites and 15 parks administered by the Taconic Region of New York State Office of Parks, Recreation and Historic Preservation.